The Super Citrus Tablet is the result of a request to us from Naples Fertilizer & Garden Center of Naples, FL. They wanted a tablet of the same specification as their citrus granular fertilizer, which was formulated several years ago to meet the need of Florida citrus. The advantage of the tablets over broadcasting granular fertilizer is that they feed up to 12 months. For example, soil testing done by Dr. Arvel Hunter of Agro Services of Orange City, Florida, documents that 70% of broadcasted fertilizer is lost in sandy soils after 10" of water (rain + irrigation). The average annual rain plus irrigation in Florida is over 65", therefore, it takes several broadcast feedings to achieve the results of one Lutz Tablet feeding. Install Lutz Citrus tablets in the root zone area. Each tablets contains elements required in citrus trees, plus elemental sulfur which create an environment in the feeding area to assist in the uptake of these elements. Special binders safely release the elements over time. When placed in the ground, the tablets dissolve slowly for up to twelve months. 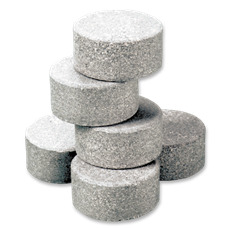 Lutz tablets work underground at the feeder roots to release the elements where the trees get their nourishment. They can't wash away like surface applications.